For scholarly articles and journals look no further than the EBSCO (Electronic Journals Service) for thousands of articles. We've also recently added the Oxford Reference Online to our collection of databases. The Oxford database provides access to thousands of articles from the world's most trusted sources. Articles are from Encyclopedias, Dictionaries and other Oxford publications. One of the really great features is that the articles are already cited for you to simply copy and paste onto your Works Cited page! In addition to the above databases we have quite a bit more, like the awesome CQResearcher, which is the place to go if you need a topic to write about. All of these databases are 100% free for you to use either from here in the library in the lab or at home. If you do use the databses at home some will require a log-in. Drop by the library and ask for the bookmark that has the log-ins and passwords to all our online databases. Using the information on the bookmark you will have access to the databases on your home PC/Mac/Laptop whenever you need them. 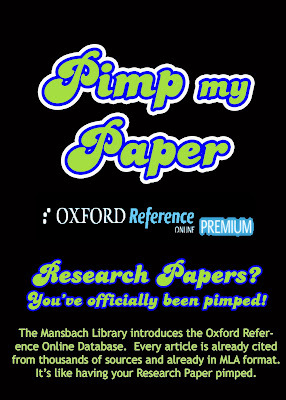 By using the Mansbach Library and our online databases your Research Paper will have officially been pimped. Saturday, March 15 -- 8:00 a.m. to 1:00 p.m.
Monday-Thursday, March 17-20 -- 8:00 a.m. to 4:30 p.m.
March is National Crochet Month. It's not just Granny Squares anymore! For more information visit Crochet Guild of America website. Visit the Lion Brand Yarn website for free instructions on how to crochet, free patterns, and information on crocheting for charity. If you need help accessing NetLibrary, please contact the Library. Happy Crocheting! The Roberts Drive Library will be closed during Spring Break. We have gotten quite a few new books in over the past several weeks. If you are looking for something great to read over the break we encourage to stop by! Have a safe and relaxing Spring Break!